LETTER: That great Larapinta Trail! Sir – Seven lucky University of Adelaide students were sent on a once-in-a-lifetime journey to the Centre of Australia. 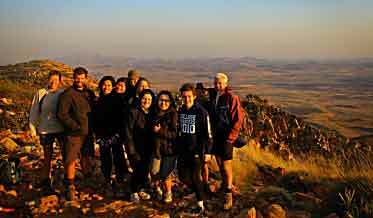 Through a joint partnership with the Professions Student Ambassador Program, Trek Larapinta and the NT Parks and Wildlife Commission, the students were exposed to an unforgettable eight days of Australian outback. It is a current push with the Government – getting people involved with the indigenous culture, and also out in our “backyards”. The opportunity developed after returning from an Educator’s insight trip, offered through Territory Discoveries. The immersion program exposed me to parts of Australia I never knew existed, and opened my eyes to the vast array of opportunities and contributions we can make in the Centre of Australia. The 223km long Larapinta Trail was worth fighting for and the moment the week began we all knew we were on top of the world. The volunteering aspect of the week was to repair the trail after recent bushfires that had severely damaged many parts. These activities, although quite tedious and time consuming, were offset by the beauty of the track. The sunrise was definitely worth every step and early wake-up call. The amazing people we met and worked alongside shared a passion for knowledge and a commitment to preserving our fragile environment. For the University to send its students along the Larapinta Trail, we are acknowledging and seeking to engage that fundamental community spirit. We have learnt so much from the outback, from each other and have developed numerous life skills, many of which we would not have even realised yet. Strangers at the beginning of the trip, we have now formed friendships and networks that will last a lifetime. These eight days were by far the best way I have spent a university break. Standing on top of Mt Sonder and looking out over the desert made each and every single one of us truly understand what it means to be just one part of an even bigger world. This was no ordinary experience. I am thrilled that this lucky and little group of seven students have availed themselves to this new volunteering experience. I hope you share your exhilaration with your many friends and contacts in good old South Australia. This unique trail, which includes some of the Chewings Range, was established with the “willing” heavy lifters of the Alice Springs penitentiary and also depends upon goodwill by those fine individuals like yourselves. A great article and I trust you are all inspired to return one fine day. Regards from THE lone dingo. Ps: Even the almighty Tony Abbott would be green with envy in terms of what you have witnessed in our wilderness!